With influences like Tangerine Dream, Jean Michel Jarre, Pink Floyd and Pulsar one can see what Marcel Engels' Free System Projekt draws upon to create an air of mystery and urgencey. 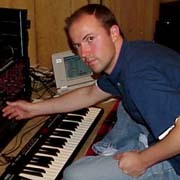 The debut release by FSP is entitled Pointless Reminder and demonstrates the artist's love of the classic analogue synthesizer sound and technique. Warm, fat bass synth rhythms drive the low-end of each piece as synchronized arpeggiations dance above. 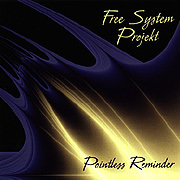 Icy strings, resonant lead lines and the occasional white noise sweep fill out the five pieces on Pointless Reminder. FSP takes us further into the zone with shifting choral and string pads drawn from the now legendary Mellotron. Used in moderation, even the percussion is vintage. We may be entering a new millenium, but FSP is embracing the sound and technology from the dawn of when keyboard and synth first met.